The first document is dated and signed on January, 1969 by John Lennon, Paul McCartney, Richard Starkey (Ringo Starr) and George Harrison also known as The Beatles. This was signed on their company stationery. This document was issued by the Beatles to attorney John Eastman, authorizing him to handle all business negotiations on their behalf. 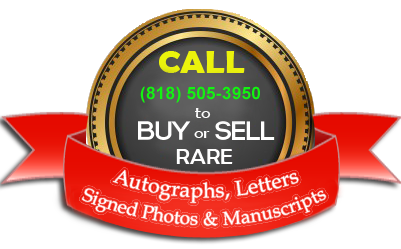 The two documents for sale serve as a behind the scenes glimpse into the contractual separation of the Beatles into two camps. The first document is dated and signed on January,1969 by John Lennon, Paul McCartney, Richard Starkey (Ringo Starr) and George Harrison also known as The Beatles. This was signed on their company stationary. 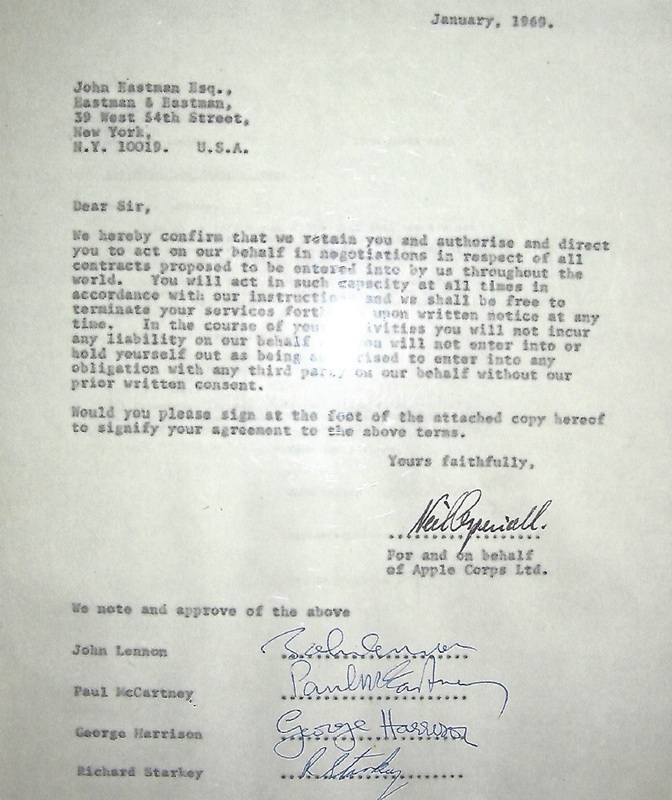 This document was issued by the Beatles to attorney John Eastman, (Paul McCartney’s brother-in-law, and father-in-law’s entertainment law firm), authorizing him to handle all business negotiations on their behalf. On January 28th 1969, John Lennon met accountant and Rolling Stones former business manager Allan Klein at a London hotel. After their meeting, Lennon was convinced that Allan should be his manager, and convinced George and Ringo to do the same. “I don’t give a bugger who anybody else wants,” Lennon said. 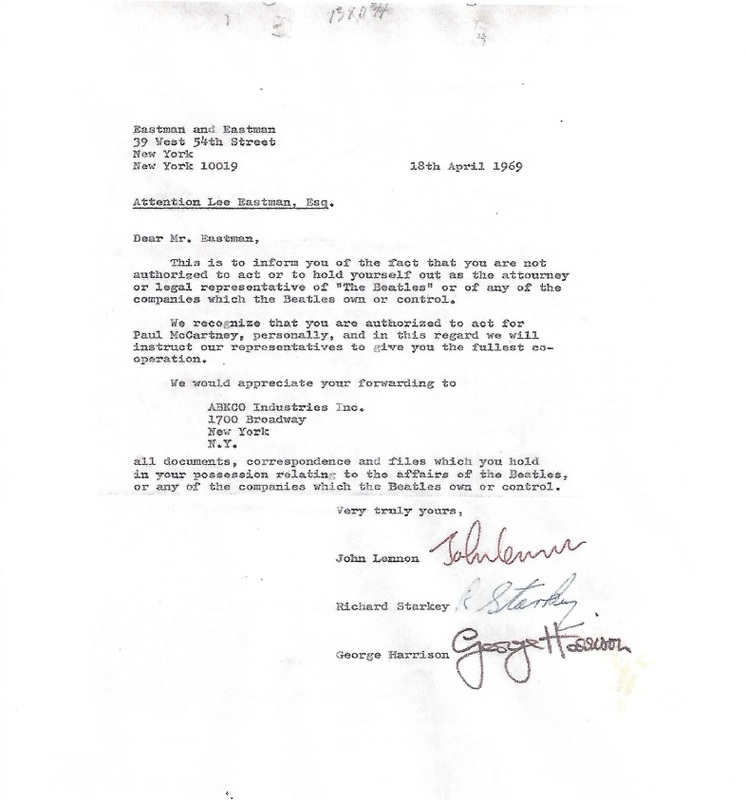 “But I’m having Allan Klein for me.” The confidence John felt in Allan, and the misgivings he felt towards Paul’s family involvement lead to the second document, dated April 18th, 1969 and signed by John Lennon, George Harrison and Richard Starkey (Ringo Starr). The letter was issued to attorney Lee Eastman informing him that he is not authorized to act or hold as the attorney of “The Beatles”. In September 1969, John Lennon privately informed his bandmates that he was leaving the band. However, Paul McCartney made it public on April 10, 1970 and announced he was leaving the band.